Deluxe models feature our Contour tube-style burner, designed to complement the hand-painted ceramic fiber log set, and produce a natural dancing flame. Choose a conventional Deluxe Tahoe model - with louvers and available trim kits - or our new Clean Face Deluxe Fireplace - with a discreet air distribution channel that eliminates the look of louvers, yet still allows you to operate the optional blower. 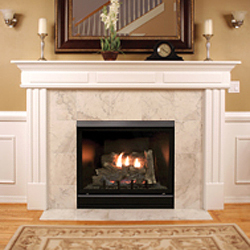 Conventional Deluxe fireplaces may be installed in the wall or in a cabinet or corner mantel. All of our Deluxe models require just 16 inches of depth and use 4 x 6 5/8 venting, making them ideal for applications where wall-cavity space is tight. Deluxe models are offered in Millivolt (with standing pilot) and in Direct Ignition (electric), which lights the flame directly, similar to the ignition in modern gas range. Millivolt systems are available in LP or Natural Gas, while Direct Ignition systems are available in Natural Gas only. Deluxe Clean Face systems are designed for in-wall installation. Tile or other non-combustible material may be used to conceal the outer edge of the fireplace to provide a true built-in appearance. Review: I just wanted to take a minute to thank you. My experience with your company has been superior. We have had prompt responses to any questions. Our fireplace and accessories were shipped promptly and by a really great freight line. We have been thrilled with the service we are receiving regarding a small warranty issue. I highly recommend your company and just wanted to thank you for making this such a pleasant experience. Review: We are extremely happy with this fireplace and with how simple it is to install and to hook up. This unit looks great and functions very well. The best part has been the service we have received through the Direct Vent Fireplace Store. We got a really great price, fast delivery that included unloading the fireplace from the truck, and they have been great about an issue we had with the glass after it was unpacked.